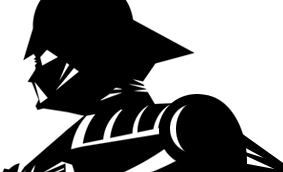 This figure debuted in the United States on The Power Of The Force card, and in Europe on the Tri-Logo card. It was never packaged on a Canadian card. The Carbonite Chamber accessory was packed in front of the figure on The Power Of The Force version, and behind the figure on the Tri-Logo card. Comments: The vintage Han Solo (In Carbonite Chamber) was certainly a great action figure, and there are hardly any arguments to prove otherwise. That being said, it?s odd that it didn?t come with a weapon. Sure, one could counter by saying the huge ?Carbonite Chamber? makes up for it, but in truth that was to make up for the figure?s lack of eyebrows? 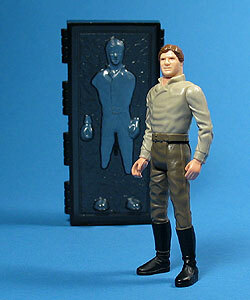 Major Variations: Though all vintage figures have minor variations, the Han Solo (In Carbonite Chamber) action figure has no known major variations. The Carbonite Chamber accessory packed in with this figure is the second one produced by Kenner for the vintage toy line. The first was a pack in with the 3 3/4? scale Slave I vehicle. Though they are both based on the same film prop, both are different in many ways. Where as the Slave I version, moulded in black plastic, has a more accurate sculpt, the Han Solo (In Carbonite Chamber), moulded in translucent plastic, is the proper scale and sports feet (oddly omitted on the Slave I version).